Hotel Royal enjoys a nice setting very close to the centre of Golden Sands resort, some minutes walk from the beach stripe. The hotel offers a wonderful panoramic view over the whole resort and a large choice of on-site facilities. There are plenty of shops, restaurants and cafes nearby. 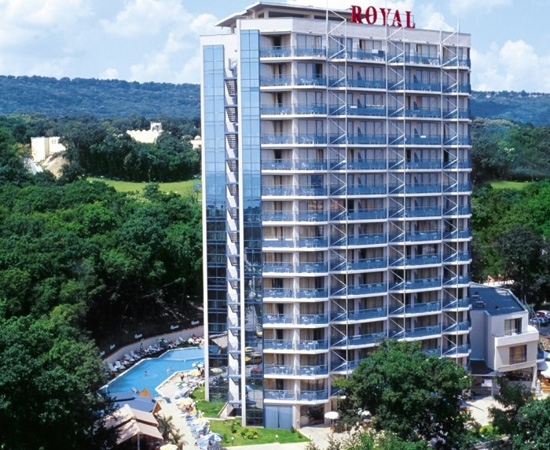 The hotel is only 5 minutes stroll to the entertainment centre “Aquapolis”- one of the best attractions of that kind in Bulgaria. Surrounded by green areas, the hotel is the perfect choice for your holiday, close to all attractions the resort can offer, and only 300 meters from the glorious sandy beach.